SPEAKING TOPICS: SHIFT HAPPENS!® NOW WHAT? Jim has been challenging organizations to unleash great innovative solutions and meaningful experiences. He believes that looking ‘inside the box’ using his 3D Thinking will help organizations to see differently, to understand better, and offer informed decisions to their management. Jim is provocative, controversial, and outside conventional wisdom. He has conversations with your attendees in order to open their minds to some new ideas and suggestions. He asks your audience to establish an end result or goal first, then create the path to get there. It’s not about creating a ‘shift’ merely to create a shift. Rather to shift to get to a better position in order to seize the future. Saying YES to one thing means saying NO to another. Say yes…and call Jim’s office to get more information on how to develop new outcomes, categorize new opportunities, and prioritize the results. If you seek a presenter that is provocative, humorous, insightful, entertaining, and someone that thinks outside conventional wisdom, Jim delivers UNCOMMON, common sense. His presentations are about your audience, interactive, and upbeat. Jim shares real-world success strategies and relevant information that can be utilized and implemented by your organization immediately which inspires people to take action. Jim has learned how to propel companies to heights of success they never dreamed possible. Your audience will leave with better understanding of the forces that will dramatically increase positive results by them ‘connecting’ with your company’s objectives and values. 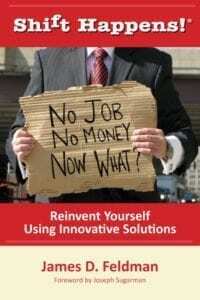 In his book, Shift Happens!® your audience will learn the secrets of moving up in a down economy, preparing for changes, and build enduring relationships with Customers, employees, and suppliers.